An experiment making the Roland System 100 (MOD102) and the TipTop Audio minisystem interact in a random access melodic theme. The “S & H out” of the Roland drive the direction of the sequencer and the clock. The TipTop programmer/sequencer controls the vcos for the melody and modulations. The TipTop Z3000 vco is used as an audio source together with the Roland vco, and as a modulator for the filter and for the Roland vco. The Z3000 is used as source for the sample and hold too. Waldorf Microwaves are top wavetable synthetizers, they are the direct descendents of the awesome PPG WAVE. Analizing the two models (assuming that the XT is an enhanced version of the 2, but it sounds the same) the most important difference is the fact that the Microwave 1 is a hybrid synth with digital oscillators with VCF and VCA (so an analog 24dB lowpass filter for each voice and a vca) while the Microwave 2 is a fully digital DSP synth. The differences are evident, the microwave 1 has a more organic and warm sound, sound heavier in the mix and is darker, the microwave 2 is more versatile as the synth has multimode filters, a cleaner sound and a lot more functions, but it sounds colder. One thing to notice is the envelope clicking. Both the 1 & 2 have env clicking, but while the 2 can be prevented from clicking with a well programmed env curve, on the mw1 the attack clicks, so this noisy attack cannot be avoided. The Yamaha PSS 390 is the “toy keyboard” claimed to have the better and best sounding FM synth engine in the toy range. It has 100 tones that can be widely modified with the tone controls, instead of button +/- it features sliders to edit the synth parameters. 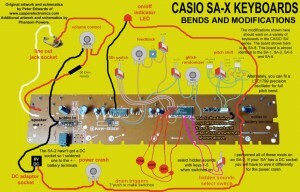 The only lack is the midi control that however can be added by retrofit. It can be seen in action in the videos of the band “the Apparat Organ Quartet”. This is a glitch/random bend by Finlay Shakespeare http://www.futuresoundsystems.co.nr . 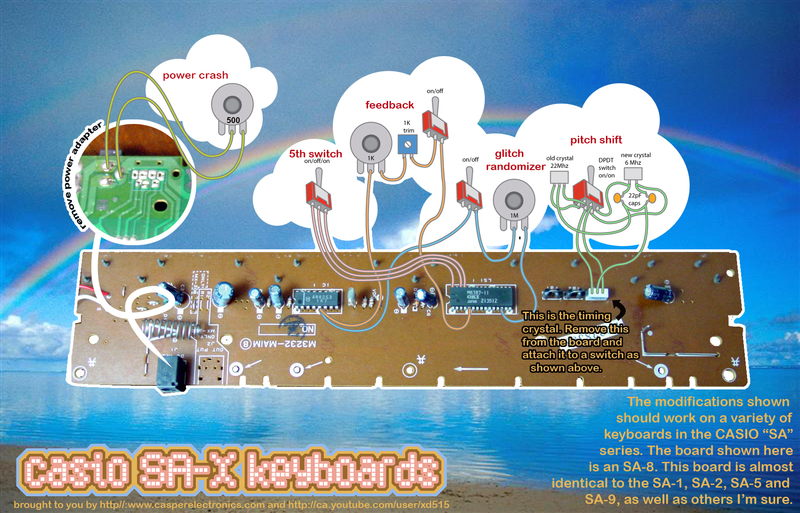 The mod was originally done on the casio sa1 but it should work with all the sa-serie. 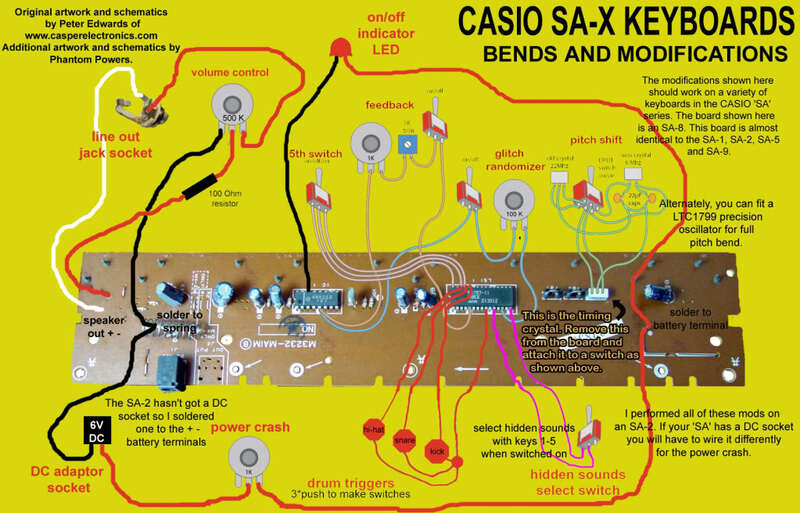 Doing some circuit bending on my casio keyboards I collected some useful schematics to “safe-bend” the casio sa serie (sa 1 2 5 8 10 20 etc). The main mod is the one from Casperelectronics that adds interesting bends as the “glitch/randomizer” , “feedback” , “5th add”, “pitch shift” and the classic “power crash”. In the forum www.circuitbenders.co.uk I found another scheme based on the casper mod but with some adds. During the late 90’s started the phrase sampler commercial boom. All the big brand had their “groove sampler” for the “groove musician”. Boss started their SP-serie , Korg marketed the ES-1 , Akai had the Remix16 (mid 90’s) then the s-20, Yamaha presented their SU-serie. 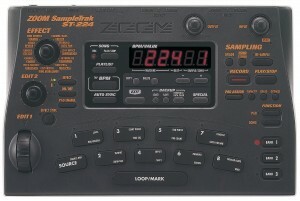 Zoom came out with the ST-224 Sampletrack in 1999, a cheap alternative to the Korg Es-1 and Boss SP-303. 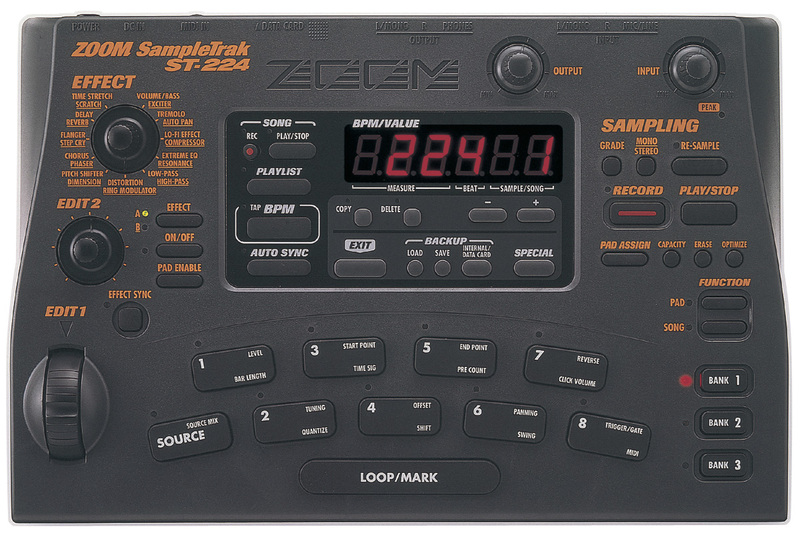 The Zoom can store up to 32 samples in memory and has a 3 bank kit with 24 samples in use max (8 samples x 3 kit= 24 samples). There are 3 sample grades: Hi-fi 32 kHz , Standard 16kHz , Lo-fi 8kHz with 18 bit DAC. The effect bank is really useful for creative manipulation of the recorded material but even to process audio in signals. This machine is quite basic but has some really interesting features. pitch scaling (to play a sample chromatically on the pads). Compared to other samplers of that period the zoom lacked a real sequencer and had no envelope for amplitude modulation. On the other hand the pitch function is the best found on this kind of sampler, and the sound is really grainy (in lo-fi mode) to be up there with the old ones like the Akai mpc60 and Emu SP1200. The Sampletrack was targeted to loops sampling/play this is the reason why the sequencer has only 8 songs and only realtime recording. The good point is that the quantize and shuffle functions are really effective on one shot samples, making the sampletrack a really good beatbox. The resampling capabilities of resample its own patterns with the sequencer running (not possible on the others loop samplers) together with the effects make the zoom stand up. There is an application (for Windows users) that can be really handy , ZMF Producer, that let you edit and program all the parameters and samples stored on the smartmedia card and to load .wav and .aiff files on the machine. This is an all in one great beatbox for hip hop / trip hop production, give it a try!